alaTest ha raccolto ed analizzato 15 recensioni su Remington XR1340G. La media della valutazione per questo prodotto è 4.7/5, confrontata con la media della valutazione di 4.3/5 per altri prodotti. Abbiamo analizzato differenti valutazioni di esperti ed utenti, età del prodotto ed altri elementi. A confronto con altri prodotti, Remington XR1340G ha ottenuto un alaScore™ complessivo di 88/100 = qualità Molto buono.
" Very good, smooth finish "
" Had to replace my shaver and chose a Remington as it was on offer. Can not fault my choice as its performance is great with value for money appreciated. " 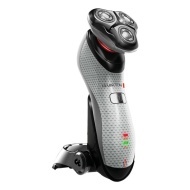 " it is a good sturdy built machine and gives you a close shave every time "
My husband loves it.. the cordless use is one of the best features this shaver has... Totally recommend it.
" My husband loves it.. the cordless use is one of the best features this shaver has... Totally recommend it. " " the golf shaver is very stylish it feels good when you hold it and the shave is good will be better in a few weeks every new razor needs 3 /4 to settle down. " the golf shaver is very stylish it feels good when you hold it and the shave is good will be better in a few weeks every new razor needs 3 /4 to settle down.